Research conducted on silicon based photodetector technology has recently shown rapidly growing momentum to develop the robust silicon based detectors for photonic applications. The thrust is to manufacture low cost and high efficiency detectors with CMOS process compatibility. In this study, a new design and characterization of PIN photodiode is envisaged. The simulation tool, Silvaco TCAD (and its variants), was used to design and simulate the processes of the device. Electrical and optical measurements such as I-V characteristics (dark current), and internal/external quantum efficiencies were analysed to evaluate the designed and processed device structure for its potential applications in photonics and other detection mechanisms. Over the last five decades, photodiodes have been used for extensive range of applications including commercial use, and military purposes . Photodetectors are optoelectronic devices which convert light energy into electrical energy and are generally used in optical communication systems. Typically, there are two types of photodetectors which are commonly used, named as p-i-n photodiodes and avalanche photodiodes (APDs). These devices have a wide range of applications in various fields of science and technology. For instance, they are used in light sensors, diagnostic tools, digital radiography, and nuclear medicines etc. The basic operation of a silicon photodetector is to convert light energy into electrical energy in which electron-hole pairs are generated via reverse bias voltage to increase the depletion region. Due to carrier drift in opposite directions, a signal is generated towards the collecting electrodes. No signal will be generated even if there is presence of electric field in the depletion region but the electron-hole pairs are produced outside. Photodetector performance depends upon the interaction of photons and charge carriers in the depletion region. By increasing the bias voltage, time performance of photodetectors can also be increased [2, 3]. can be reduced by strong reverse bias . Fig. 1. 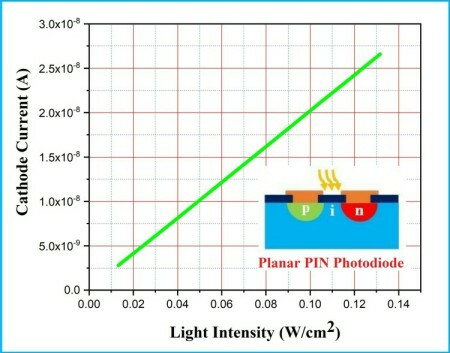 Basic structures of PIN Photodiodes. Intrinsic silicon is used to fabricate the PIN photodiode. In this structure, heavily doped P and N regions are near the intrinsic region, therefore it is referred as the P, I and N diode. In a PIN photodiode, junction capacitance is inversely proportional to the depletion region, therefore, depletion region absorbs more photons. To achieve high frequency response of the PIN photodiode, mobility of electrons should be greater than the holes . 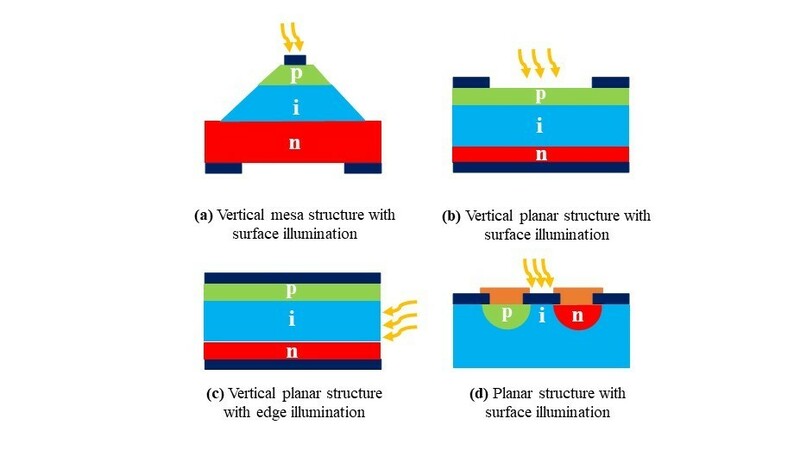 Compared to other optical detectors, silicon PIN photodiode has various advantages such as lower cost, higher efficiency, smaller size, better resolution, as well as room temperature operation capability. It is used to measure the position of light and its pixels are used for image sensing. This type of device can also be used to measure the short distance in optical communications as well as optical storage. 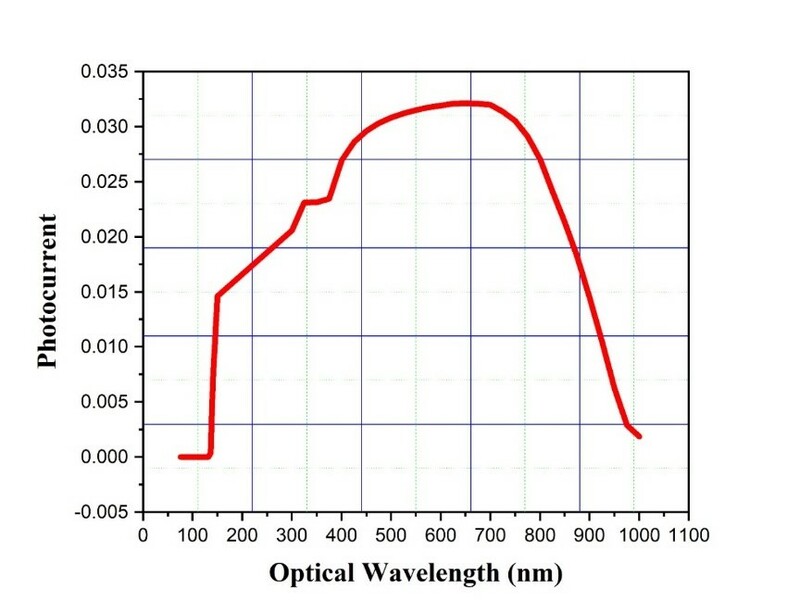 By reducing the surface reflectance, the performance of a PIN photodiode can be enhanced . N. I. Shuhaimi et al. used the Sentaurus TCAD tools to design the silicon PIN diode. They investigated the I-V characteristics as well as the effects in variations of un-doped regions on the device performance. They varied the width of the PIN photodiode while the thickness was kept constant at 40 µm. I-V characteristics and device performance at different widths (70 µm, 80 µm and 90 µm) were analysed and it was observed that as the width is increased, the current level is also increased, suggesting the importance of width optimization to realize high performance photodiodes . E Abiri et al. described various applications of PIN diode by demonstrating a device which is very similar to the conventional PIN diode with an extra layer at the centre of the layers in PIN diode, realizing a device which possess diverse applications such as modulators and demodulators, amplifiers, high frequency multipliers and resonators . W. M. Jubadi and co-workers used the Sentaurus TCAD technology to simulate the four different intrinsic layers of PIN diode with various thickness (5 µm, 20 µm, 30 µm, and 50 µm) and investigated the I-V characteristics of PIN diode. They explored the “I” layer’s thickness and its effect on PIN diode’s performance. The results obtained from simulation showed that the thinner is the “I” layer, the more forward current flows in the PIN diode, improving the overall device performance . A. W. Vergilio proposed three terminal PIN diode structure which works at forward conductive state, demonstrating the accuracy in simulation . Z. Zainudin et al designed silicon on insulator (SOI) PIN diode at Athena and analysed its electrical characteristics using Atlas Silvaco software. They investigated the performance of SOI PIN diode and simple PIN diode and realized that former produces lower leakage current as compared to the simple PIN diode. However, SOI photodiode shows poor performance in temperature variations . Here, in this paper, we developed a simulation based PIN photodiode using the commercial software TCAD Silvaco i.e. Athena is employed for designing the structure of the photodiode and Atlas is used for the evaluation of electrical and optical characteristics of the proposed device. the absorption coefficient and “w” is the width of the absorption layer. The photodetection performance can be determined if quantum efficiency of the device is known. The sensitivity of a photodetector, its noise equivalent power (NEP) and responsivity depend upon the quantum efficiency . Surface reflectivity is a unique property of a photodetector which is defined as output current divided by the incident light i.e. where, PN is the noise power over a bandwidth range, S (f) is the power spectral density, and Δf is the bandwidth . We employed Silvaco TCAD tool to design the PIN photodiode and investigated its electrical and optical characteristics. Silvaco is a simulator tool of TCAD process for device simulation and consists of Athena and Atlas . 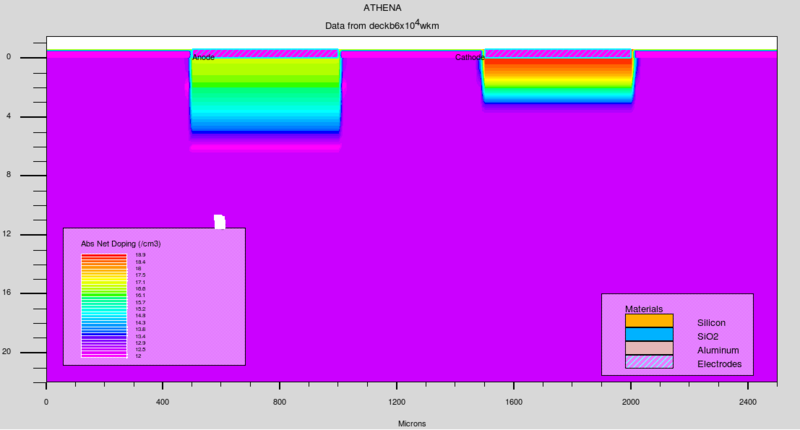 Athena is used for the design of physical structure and Atlas is used for its electrical and optical characterizations . The dimension of the designed two-dimensional device in this study is 2500×22 µm, having silicon with phosphorous concentration of 1000 ohm/cm2. 0.6 µm oxide layer was deposited on the silicon wafer for the masking purpose as well as a passivation layer. For making the P well and N well, it is necessary to make the geometrical etching at silicon based wafer to form the P well and N-well. First, we fabricated P-well for which geometrical etching was done by diffusing Boron atoms with a concentration of 8.09 ×1016 on the left side of the silicon wafer at 1200 °C for 120 min. For N- Well, the right side of the silicon wafer was diffused with phosphorus with a concentration of the 8.02 × 1018 at 1150 °C for 70 min. Aluminium is mostly used for the purpose of metallization to make electric contacts between circuits of the semiconductor materials. In the next step, aluminium was annealed at 500 °C for 30 min. The final simulated structure of the PIN photodiode is presented in Fig. 2. All the simulation codes used for the device design and characterization in this work are provided in Supplementary File. Fig. 2. Simulated structure of PIN photodiode. 4. Electrical and Optical Characterizations. electrical characterization of the device. Atlas simulates the electrical, optical and thermal behaviour of semiconductors with a special reference to the output efficiency of the fabricated device . Fig. 3. 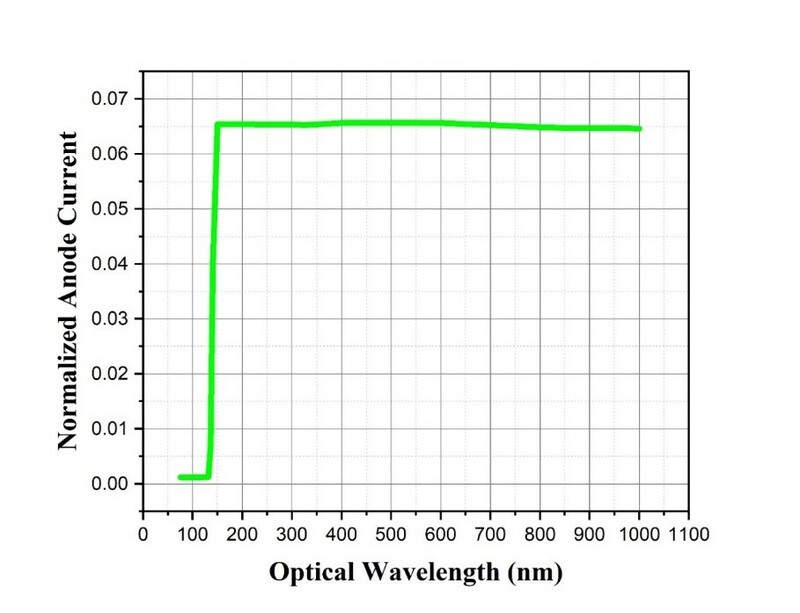 Graph between optical wavelength and photocurrent (internal quantum efficiency). The internal quantum efficiency of the PIN photodiode is defined as the number of the charge carriers composed by the device to the number of photons of a given energy incident on the device, which are then absorbed by the device [19, 20]. It is influenced by the absorption coefficient as shown in Fig. 3. The internal quantum efficiency varies with the wavelength of the incident light. Fig. 4. Graph between optical wavelength and normalized anode current. Fig. 5. 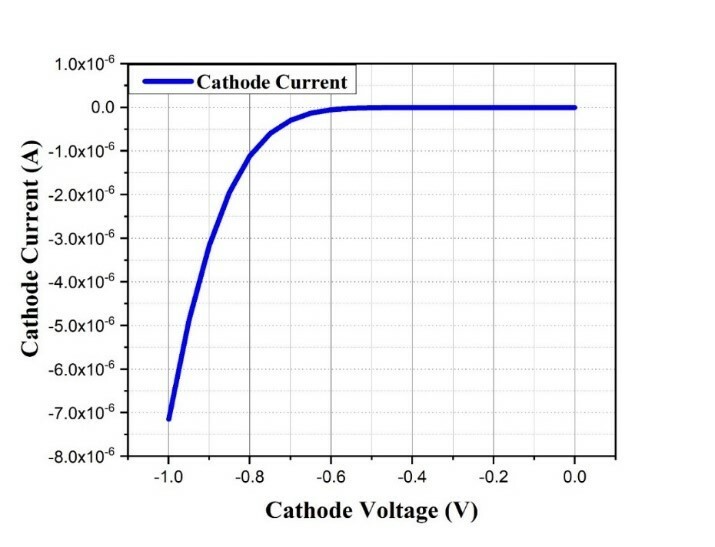 Graph between cathode current and cathode voltage. The relationship between the cathode current and the cathode voltage is demonstrated in Fig. 5. It is referred as the dark current of photodetection process. The reverse bias is applied to achieve a very small reverse saturation current [21, 22]. The device current is also observed to be decreased as the voltage increases on the cathode terminal of the photodetector. Fig. 6. 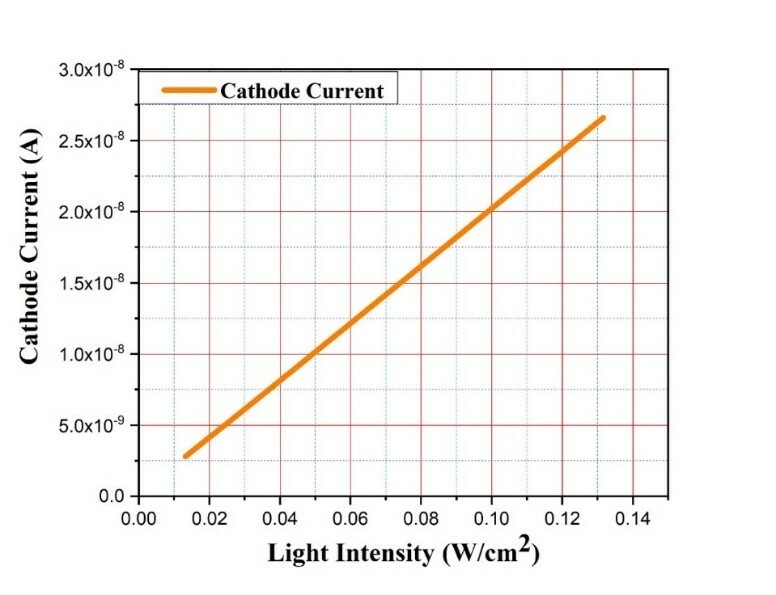 Graph between light intensity and cathode current. Fig. 6 exhibits the relation between the light intensity and the current on the cathode. When the light has no impact on the device, negligible current will be observed, while, with an increase in the light intensity, cathode current will start rising, resulting in a linear relationship, as evident by the graph . Fig. 7. 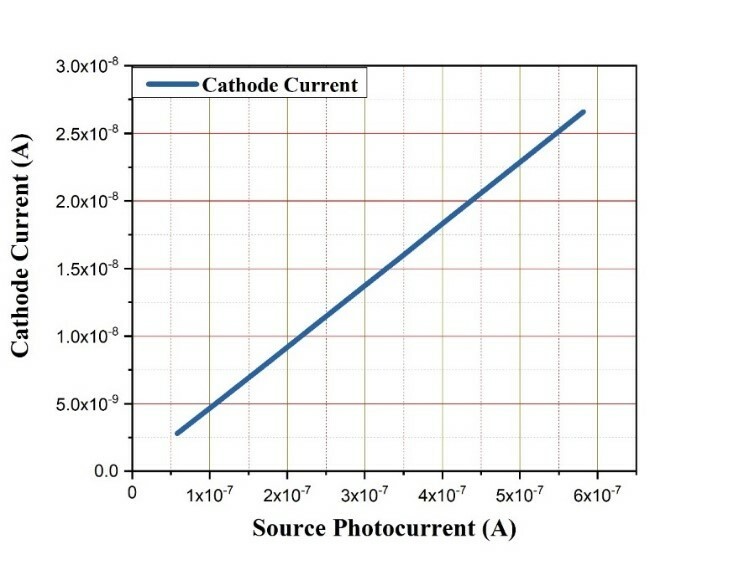 Graph between photocurrent and cathode current. Relationship between the photocurrent and cathode current is shown in Fig. 7, which reveals high detection capability of the photodiode, when light is incident on it. The graph clearly presents the capability to detect even at very narrow scales . It is evident from the graph that when the photocurrent increases, the cathode current increases linearly. Fig. 8. Graph between source photocurrent and cathode current. 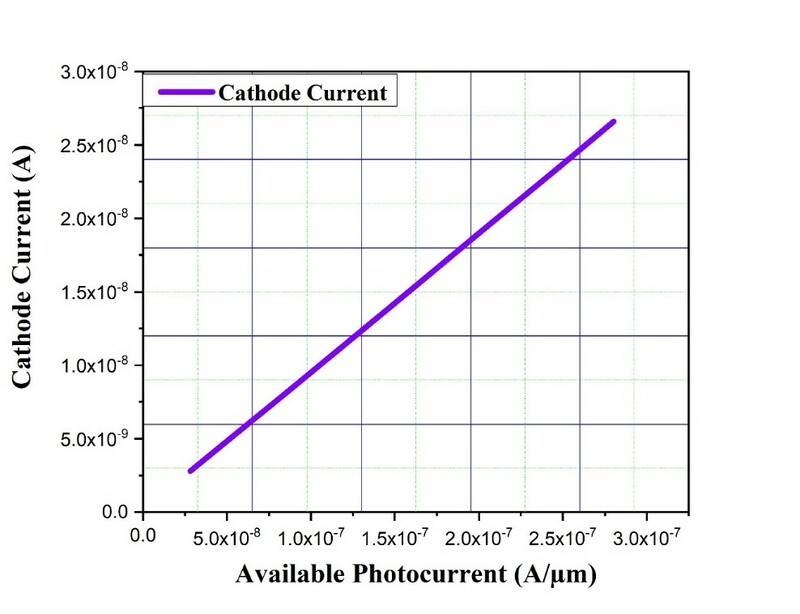 The variation in cathode current as a function of source photocurrent is depicted in Fig. 8 for the case when light is incident on the PIN photodiode. The photocurrent increases when the light is incident on the detector, which in turn increases the cathode current in a linear fashion . These optical and electrical characterizations confirm standard device performance of the simulated device. A rigorous design approach was maintained in this work to provide an industrial driven process recipe in order to effectively design a “planar” structure of quadrant photodetector compatible with concurrent CMOS technology. The trade-off designed parameters between the quadrant geometry and PIN photodiode processing yields a significantly cost effective and efficient solution to manufacture such photodetectors. Less number of processing steps with better uniformity was observed as an advantage of the proposed design strategy. The applicability of the process and the device scheme was testified and presented as a proficient design for the consequent fabrication. Vertical geometry of a photodetector based on PIN diode structure may be investigated in order to evaluate the impact of geometry on the efficiency of detection and sensing. Detailed analysis and possible tailoring of underlining physical model of the simulation tool may yield a better understanding on the fine tuning of process and device parameters for photonic applications. One may look for other competing choices of starting material (substrate), for example SiGe or III-V semiconductors, to design this device in “beyond CMOS” approach for variability of applications. The authors would like to appreciate M. Ali from the Advanced Electronics Laboratories, International Islamic University Islamabad, Pakistan for his precious support and guidance. How to cite this manuscript: Waqas Ahmad*, Muhammad Umair Ali, Vijay Laxmi, Shuja Ahmed Syed. Simulation and Characterization of PIN Photodiode for Photonic Applications. 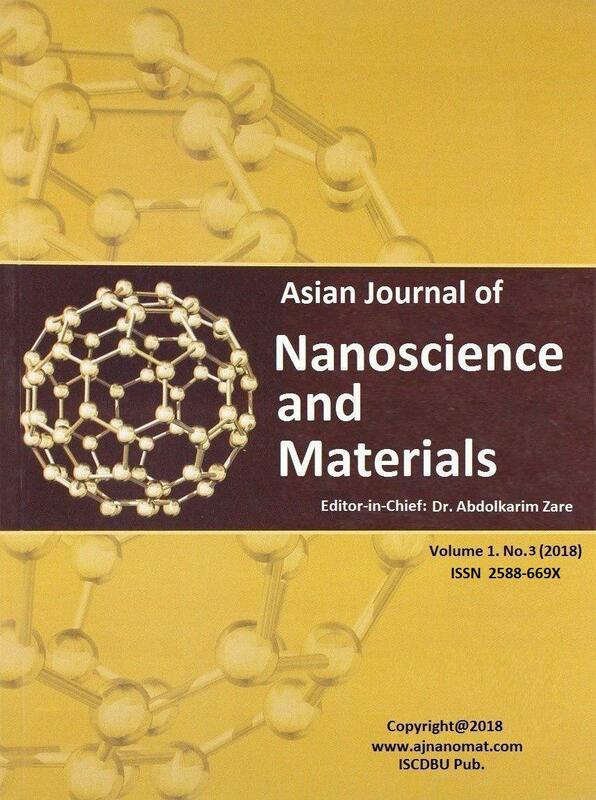 Asian Journal of Nanoscience and Materials, 2018, 1, 119-131. 1. Bank SR, Campbell JC, Maddox SJ, Ren M, Rockwell A-K, Woodson ME, March SD (2018) IEEE J. Sel. Top. Quant. Electron 24: 1-7. 2. Bisogni MG, Morrocchi M (2016) Nucl. Instr. Meth. Phys. Res A 809: 140–148. 3. Palai G (2017) Optik 133: 108–113. 4. Menon PS, Shaari S (2004) The 4th Annual Seminar of National Science Fellowship, Malaysia. 5. Yotter RA, Wilson DM (2003) IEEE Sens. J 3: 288-303. 6. Alexandre A, Pinna A, Granado B, Garda P (2004) IEEE ICIT’04 1: 142-147. 7. Andjelkov MS, Risti GS (2015) Radiat. Meas 75: 29-38. 8. Shuhaimi NI, Mohamad M, Jubadi WM, Tugiman R, Zinal N, Zin RM (2010) ICSE 12-14. 9. Abiri E, Salehi MR, Kohan S, Mirzazadeh M (2010) PACCS 1: 60-62. 10. Jubudi WM, Norafzaniza S, Noor M (2010) SIEA 428-432. 11. Vergilio AW, Pekarik JJ, Jain V (2014) BCTM 207-210. 12. Zainudin Z, Ismail AF, Hasbullah NF (2014) Computer and Communications Engineering 268-268. 13. Mohammed WF, Tikriti MN (2014) SSD1-5. 14. Conradi J (1981) Proc. SPIE Int. Soc. Opt Eng 266: 49-55. 15. Razeghi M (2017) Vacuum 146: 308-328. 16. Athena User Manual (2016). 17. Device Simulation Framework http://www.silvaco.com/products/device_simulation/atlas.html. Accessed 09 April 2018. 18. Atlas User Manual (2006). 19. Fallahpour AH, Kienitz S, Lugli P (2017) IEEE Trans. Electron Devices 64: 2649-2654. 20. Qiu X (2018) Adv. Optical Mater 6: 1700638. 21. Yi X, Huang Z, Lin, Li C, Chen S, Huang W, Li J, Wang J (2017) J. Semicond 38: 042001-5. 22. Bartolomeo AD, Luongo G, Giubileo F, Funicello N, Niu G, Schroeder T, Lisker M, Lupin G (2017) 2D Mater 4: 025075. 23. Bie Y-Q, Grosso G, Heuck M, Furchi MM, Cao Y, Zheng J, Bunandar D, Navarro-Moratalla E, Zhou L, Efetov DK, Taniguchi T, Watanabe K, Kong J, Englund D, Jarillo-Herrero P (2017) Nat. Nano 12: 1124-1129. 24. Su Z, Hosseini ES, Timurdogan E, Sun J, Moresco M, Leake G, Adam TN, Coolbaugh DD, Watts MR (2017) Opt. Lett 42: 2878-2881.